The dancing toaster is a prop used in a very memorable scene in Ghostbusters 2. To show Peter the effects of positively charged slime, Ray and Egon take a normal household toaster and drip some slime into each slot. When Jackie Wilson's "Higher and Higher" is played on the boombox, the toaster begins to hop up and around a pool table. Interestingly enough, toast pops out from the slots without a sign of slime. 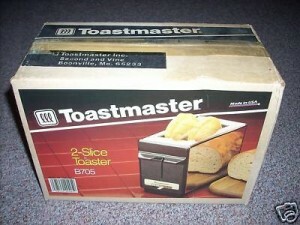 The toaster used for this scene is from the Toastmaster B700 two-slice model line. This style of toaster first appeared in 1978, and became America's most popular toaster. The one in the film is fairly modified; the power cord was removed from the back corner of the unit, and angled baffles were installed in the slots. In the film, the toaster was pneumatically driven. As is often pointed out as a goof, you can see the legs popping in and out from the toaster base. The rather large "power cord" is actually an air hose to drive the actuators from a remote location off-screen. If you look at the underside, there is a zip-tie holding the hose to the bottom of the toaster. As a point of interest, this location is not where the original power cord is on the toaster.